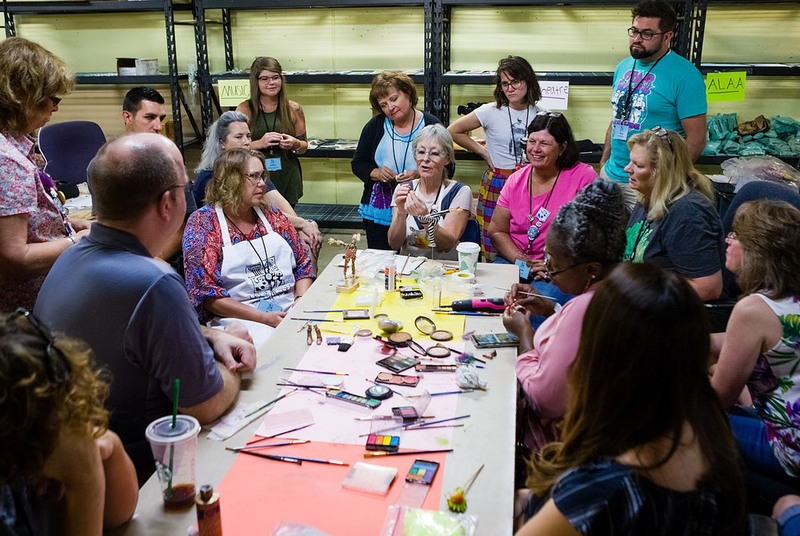 More than 300 arts educators from across the country visited Belmont this week to participate in the 2018 Tennessee Arts Academy (TAA), an intensive training experience that provides professional development and support to K-12 teachers from across the state. Now in its 32rd year at Belmont, TAA’s participants choose one of two divisions (either K-6 or 7-12) and then their track — music, theater, visual art, a combination of all three or arts leadership — allowing them to further hone the skills they teach in their classrooms each day. Although the Academy exists to ensure Tennessee educators, primarily those within the arts, are utilizing advanced curriculum and cutting-edge methodology, the program’s purpose expands beyond professional development. TAA Project Director and Professor of Music Dr. Madeline Bridges said that in addition to the classroom skills participants walk away with, camp staff is dedicated to treating each teacher as a “guest of honor,” understanding the dedication and commitment they pour into their careers. While on campus, educators spend time in track-specific and interdisciplinary courses, all taught by world-renowned faculty members from the US and Canada, where they receive cutting-edge techniques in small classes. Beyond their time in the classroom, participants attend numerous performances and exhibitions during the week. A highlight of each day is an early afternoon ‘Musing’ plenary session presented by a nationally known arts figure. Speakers “muse” about the role of art in their lives, education and beyond. Headliners this year included Broadway star Laura Osnes and award winning scenic and costume designer Tony Walton. At the end of the week, all educators leave with a complete set of the recommended materials discussed throughout their sessions including curriculum, books, materials and more.